Extending your pool season is always a good idea. Not only will the kids get to splash into the fall season, everyone will get the benefit of a warm pool to continue their work out regimen, gain physical activity hours and add more quality family time. Cost - What will the budget will allow upfront? Size - How large is pool being heated? Position - Is the pool in ground, or above ground? Environment - What is the impact on the environment? Operational Cost - What will it cost per year to operate? Installation Ease - Will it be professionally installed, or DIY? Natural gas and propane heaters - While not the most expensive investment upfront, generally about $800.00 - $2,300, your energy savings is not as large as a solar or pool heat pump. Still, what works for you, may not always be for everyone. A gas or propane heater may be the perfect addition. 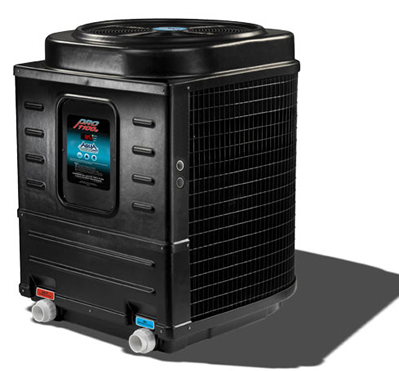 Pool heat pumps - This electrical option is by far the most popular of choices due to both long-term and immediate energy savings when compared to gas or propane. Up-front cost is slightly more, $2,000 - $4,600, but the energy savings, comparatively is cut by 82% -- quite a big deal. Wood fired heaters - With the addition of a wood fired heater, you will not have to pay higher electricity bills or propane/gas costs, just add wood of any kind. Cost to purchase the unit and necessary parts generally run about $2,500 - $3,000. Solar - By far the least expensive option to start, the solar approach utilizes a free source of energy: the sun. With a start-up cost of about $300 -700, it's easy to start with a solar heating option and stick with it, or decide to upgrade later on. The use of a solar blanket is recommended to maximize the effectiveness of your pool heater. Solar blankets are available for in-ground and above-gound pools, with or without a reel system. The most budget friendly method to slightly heat the pool is the Liquid Solar Blanket. Priced at just $45.00, this choice makes purchasing several an easy thing to do. Please review the detailed descriptions of our pool heating options on our website and choose to enjoy your extended summer swim season.